Do you know Jenn Cuisine? If not, you better bookmark this gluten-free blogger. Once you start reading her blog your senses will trick you into an addiction – your eyes will crave her imagery and your taste buds will have you clamoring for her lovely dishes. For quite a while now I have been lured in by her absolutely astounding photography. Her gallery on Foodgawker speaks volumes of her talent. Her photos seem perfect, professional, powerful. And her recipes? Well they seem to match the level of her photographs. 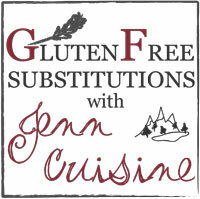 Recently, Jenn started an amazing series on her blog: Gluten Free Substitutions with Jenn Cuisine. She is currently in week ten of the fifteen week series, this week’s installment covering the basics of gluten-free pizza doughs. She has covered everything from easy one ingredient substitutions, to flours and binding agents, from home-made pastas and pie crusts, to how to handle your flops, and everything else in-between. These weekly posts will give you the confidence in your gluten-free kitchen to take you beyond what you thought you were capable of. For newbies and veterans alike, there is something to learn from each week. With all this being said, I suppose you may have guessed by now that it is Jenn that I decided to adopt for this month’s Adopt a Gluten-Free Blogger Round-up being hosted by Sea, of Book of Yum. Sea is the original creator of this wonderful event that has turned into an amazing way to bring the gluten-free blogging community together. I had a difficult time choosing a recipe since Jenn has so many tempting choices on her blog. Considering that I have not been in too much of a baking mode as of late (I need the temps to dip below 90 first), I decided to go with a few of her savory fall dishes. 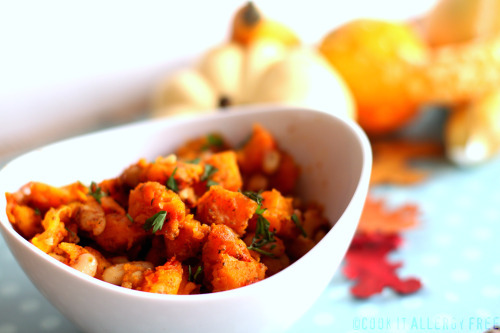 I have been craving butternut squash lately, and as luck would have it, Jenn happened to have a two-for-one recipe utilizing this lovely winter squash. First up was her Buttery Pan Fried Butternut Squash. Roasted butternut squash, pan fried with cannellini beans in a LOT of butter with sage, tarragon, and nutmeg. How could you go wrong? The combination of flavors along with the rich buttery finish, was a perfect accompaniment to the main dish of the evening (more on that in a moment). The best part of this pan-fried goodness, however, was the fact that both of my kids ate every bite of it without being asked twice. To me, that is often what makes or breaks a recipe in this house. This one will be made again, especially because I get an entire second meal out of it the next day. Enter the two-for-one part of the recipe. 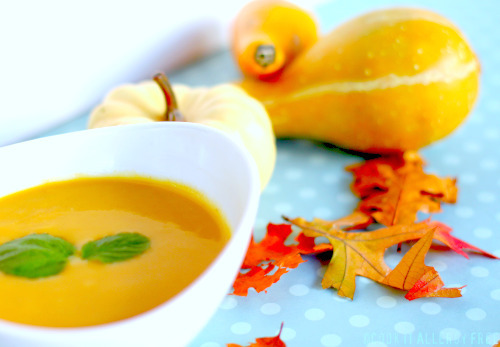 Jenn originally loved this recipe so much that she decided to spice it up the next night, turning it into Creamy Butternut and Pumpkin Soup. She took the leftovers, pureed them with some pumpkin puree and broth, a bit of cream, and she had dinner for the next night. And to tell you the truth, I think that my kids loved it even more on night two. I had made Shauna and Danny Ahern’s fabulous bread recipe from their new cookbook, The Gluten Free Girl and the Chef: A Love Story with 100 Tempting Recipes (on sale now), and the kids were in heaven dunking their hunks of bread into this soup (as were my husband and I – though the true tests of recipes in my house are done by my pint-sized reviewers). The flavors of this were so enticing. And guess what? We even closed our eyes and could almost pretend that it was cold and fall-like outside while we were eating this (instead of the near triple digits that it really was). Wow! Yes. This recipe converted a fig-hater into a total believer of the unique little fruit. That says a lot. Everyone at the table gave this meal a resounding two thumbs up, including my boys who again ate every bite on their plate. What was even better was that the few slices of leftovers were perfect for sandwiches for myself and the kids the next day. And the caramelized apples and figs that roasted in the juices of the pork added a perfect sweetness as a spread on those sandwiches. I would make that roast again and again simply for the fabulous sandwiches that resulted from it the next day! I had a blast this month with my adoption of Jenn and I officially claim this a total success! If you have not already done so, go check out her blog and leave a comment here about what you think of her beautiful imagery! What a beautiful adoption, Kim! So much shared about Jenn and her amazing recipes and stunning photos and then the success of these dishes with your family and your equally stunning photos–just totally lovely. All these dishes look phenomenal, but that pan-fried butternut squash is calling my name! LOL Oh, and yes, I love Jenn’s substitution series, too. It is soooo comprehensive and is helping everyone! Shirley, I so appreciate your words of support! 😉 You are such a special person. Jenn is really spectacular and I am envious of her amazing photography skills. And you should totally make that Pan-Fried butternut squash, especially because you can get another meal out of it too! Wow Kim! I could not have asked for kinder words, I am so completely touched by all of the lovely compliments you have for me. Thank you so much. I am so glad that you enjoyed all the recipes! 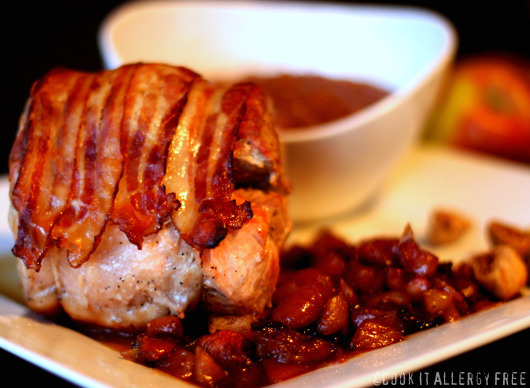 Oh and what an awesome idea to add bacon to the pork roast – mmmmm!! Jenn, you so deserve every accolade! You are so talented. One of these days, I am going to pick your brain for photography tips!! And I am so impressed with your Foodgawker gallergy. I have not had the guts to submit anything to them yet. One of these days I will. And yes, I always roast my pork loins with a few strips of organic applewood bacon on it. Maybe not the lowest in calories and fat, but man does it add some nice flavor and moistness! I love Jenn’s blog and agree with everything you’ve said about it – it’s a gluten free recipe treasure trove! Hi Jas! Yes you totally have to make Jenn’s blog one of your regular stops. Full of beautiful photos and wonderful recipes! Just gorgeous. You two are the best GF photographers around. Congrats to both of you in Carol’s photo contest. My adoption of Jenn last month was a success, too. I can almost see your family dipping bread into soup and pretending it’s fall despite the heat. Come on over to Ohio and you can have the real thing. Brrr. Wendy, you are too too sweet! I truly appreciate your words, more than you know! 🙂 However, your photos are equally beautiful and you definitely did Jenn’s recipes complete justice last month with your awesome photos!! Oh, I wish I could go to Ohio and feel the real thing! The talk around here this week is how exciting it is that it will actually dip below 80 during the day!! Wow! I can’t wait to check out Jenn’s blog with such a rave review! I’m also going to change my menu plan this week and try the buttery pan fried butternut squash with my kids. Hi Barb! You will love Jenn’s blog! You will find so many wonderful recipes there. And yes, this pan-fried butternut squash is truly wonderful!! Thanks Kathleen!! I appreciate it! Hey Alex! Ooops! You beat me! I was just adding yours and Amy’s Slightly Indulgent link when you were leaving the comment. Got distracted by the Apple Sunflowerseed butter granola that I am making and having to stir every 20 minutes. It keeps throwing off my productiveness tonight! This is such an amazing assortment of recipes, and all with my favorite flavors – pork, apple, butternut squash. Yum! This is the kind of food that I love to return to again and again. Thanks for sharing these recipes and Jenn Cuisine with us at the Hearth and Soul hop. Jenn’s site is jusst fantastic, she explains the why as well as the how. Nice twist to the roast with the bacon. Yummm…. Hi InTolerant Chef! I so agree that Jenn is fantastic. See you this week on the Hearth and Soul Hop! It all sounds amazing but I really want to try the first squash dish – oh yum! The true test of a recipe at my house is if my kids like it or not also – they can surprise too with what they will eat! thanks for sharing this with us at the Hearth and Soul Hop! Hi Christy. Funny how it is our kids taste buds that now determine our meals. 😉 But they always surprise me too with what things they really like! Kim what an awesome adoption, I adore Jenn’s blog, it is so, so helpful in the science of GF baking department! And girl, your photos are GORGEOUS! I think it’s time for me to go take a few lessons, LOL! Heidi!! Missing you! Thanks for the props on my photos. If you find any good food photography classes let me know. I would totally travel to take one with you! Hi girlichef! Thanks so much for the kind words about my photos. Now if I could only take some lessons from jenn! See you this week on Hearth and Soul! I agree with the others. Your pictures are fabulous too. I would like to improve in that area, but it’s a matter of finding the time. This is a great adoption post. I agree that Jenn has a wonderful blog. Thanks for sharing this at GF Wednesdays. Thanks Linda. i know that finding time for the photography is really hard. It is probably why I do not post more often. It takes me a really long time for each shot. Wow!! those dishes look delicious and you really did a wonderful job with the photography. I’m not a huge pork fan (other than that BACON! lol) But I LOVE LOVE LOVE butternut squash!! it’s so good!! This is a great “adoption” post! Great job Kim! Hi Carrie! 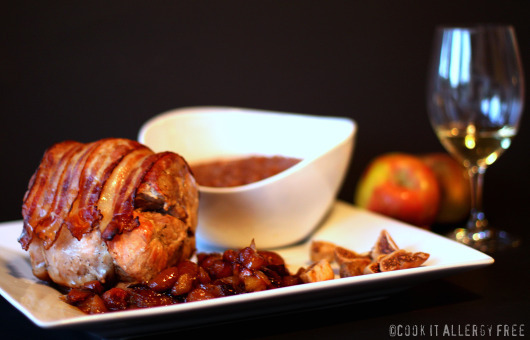 This pork dish is actually really really delicious, even if you are not a pork fan! But, of course, the butternut squash dishes are both amazing! Thanks for the kind words, my sweet friend. What a lovely post. I love your photos- great attention to detail and food styling- nicely done! So glad you joined us this month. Also, it was a complete delight meeting you in person at BlogHer. I hope it will be the first of many meetings! Wow, that’s what I was looking for, what a stuff! present here at this weblog, thanks admin of this site.